Well, I just “binge watched” fourteen episodes of “The Woodwright’s Shop” and it was pretty spectacular. Roy Underhill has such an easy manner about him that he is almost able to make the show come alive, as if he is right in the room with you…. Oh wait, he was in the room. Bad jokes (dogwood, the tree you can tell by its bark! ), frenetic energy, hand tools and mystery dovetails galore. The only thing he did not do was cut his hand. What a lovely place –masters above, Roy at the front, tool cabinets, and the bench signed by all the great instructors. Note the coffin to the right front. 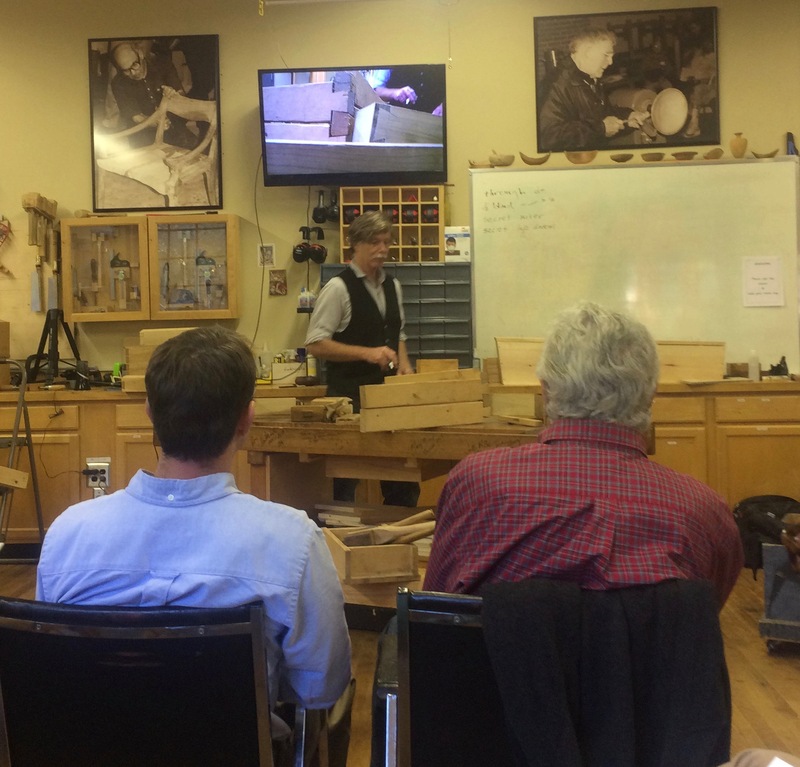 Roy came to Highland for the weekend and taught a daylong class on Sunday to about 30 fans and hand woodworking enthusiasts. It was a joy. I have been watching his show for almost as many years as he has been making it (though usually not fourteen at a time) and I still enjoy it. If you see Roy in person, as on the show, you begin to realize there is a large intellect in there despite the dumb jokes. For instance, every now and then he lapses into French and seems very comfortable doing so. Occasionally you catch an obscure historical reference indicating a widely read, well-educated man. Class members started out taking notes like they were in college, but it soon became apparent this is not your Mama’s college class. We jumped from why the screw handle on a bevel gauge was made all wrong (bad English tools as revenge for loss of the colonies), to the dovetailed log cabin at Shakespeare’s birthplace as prelude to American log cabins. Of course, our subject for the day was the dovetail joint with numerous variations. We covered them all and Roy made most of them during the class. I don’t think he messed one up all day, at least where any of us could tell. The standard dovetail he made looked to me to be a little bit tight and I thought he would never get it put together. He did get it to close up tight and it was lovely. We all got a laugh when he pulled that Lie-Nielsen Dovetail Saw with the three foot blade out of a coffin (thats right, a coffin) he made on Saturday at the store demonstration. He really did cut a pin with one stroke of that thing. I suspected many of my classmates had never heard a perfectly tuned and sharpened hand plane make that distinctive “snick” sound. It was many years into my woodworking career before I recognized the sound because I was not capable of sharpening and tuning my planes well enough to make that sound. It is always lovely to hear and of course, Roy is a master of that particular skill. A Dovetail you cannot put together or take apart. It was a great day. If you get a chance to go to a class with Roy, by all means do so. Even better, he runs a school in North Carolina and you can find the class schedule here. Check out the Highland class schedule here and come on down. By the way, you will look a long time for a dovetailed log cabin at Stratford on Avon. Log cabins did not exist in England. And send a comment note if you want to see how that dovetail in the picture comes apart. Yes, how DOES that dovetail come apart?? 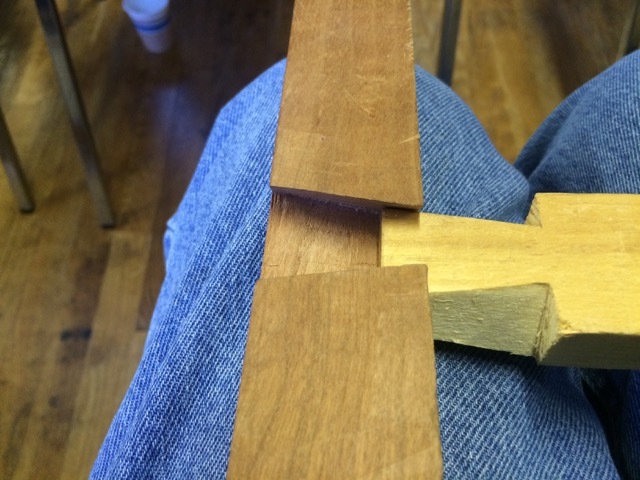 I THINK I SEE A PARTING LINE ON THE FEMALE PART OF THE IMPOSSIBLE DOVETAIL JOINT… ITS HARD TO MAKE OUT, BUT IT WOULD MAKE IT POSSIBLE TO BUILD THAT JOINT WITH FOUR PIECES OF WOOD. 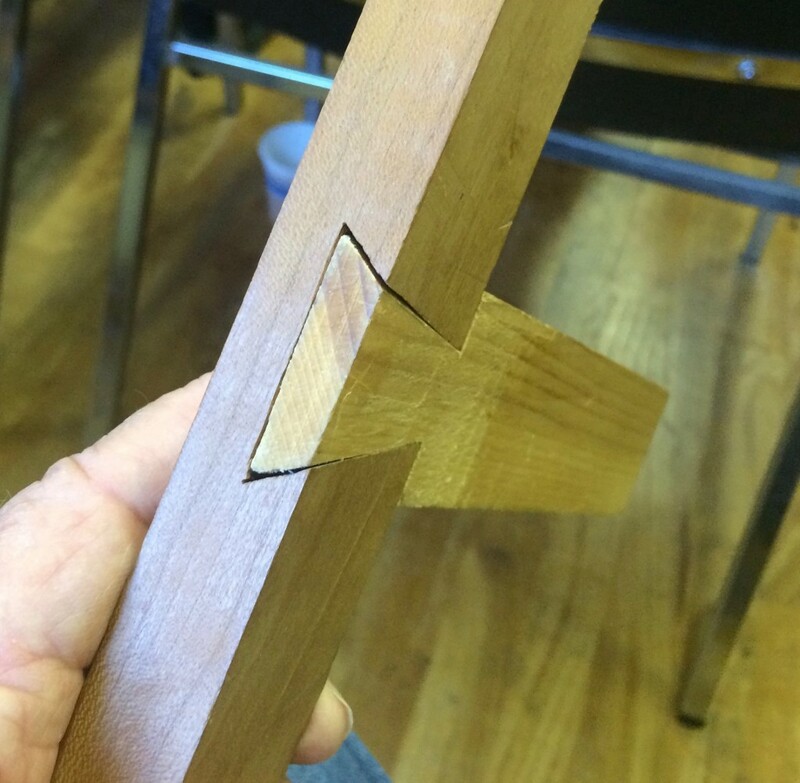 How does the Dovetail come apart? Saw him at Amana in the distance. He appeared to be very popular. I watch his show religiously on a weekly basis. Next to Rudy Olsonnik I feel Roy is a gifted teacher. Tage Frid and Krenov aside are interesting and I have met and studied with them all but Roy Underhill allows you to be just plain folks, regardless of your skill level. Watching Krenov spend most of an hour to position a table/bench before he started to impart wisdom appeared to this humble sole as the height of arrogance. Olsonnik got to work with us and after five hours I went to my shop and fabricated everything. As I do with the work from Mr. Underhill. My complements sir. You are a reacher! The Highland Woodturner, October 2015 issue POLL: Are Most Woodworkers Also General-Purpose DIY-ers?